If you’ve discovered mold in your home or office, it can be frightening. Over the last few years, mold has been getting a lot of attention–and rightfully so. The presence of mold due to water damage or moisture build-up can cause health issues if not taken care of promptly. 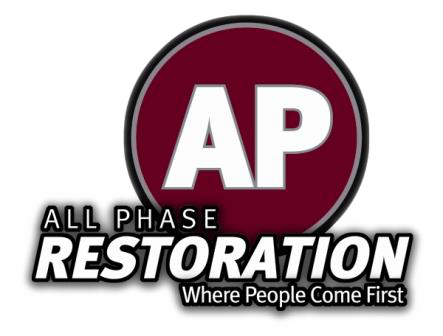 All Phase Restoration offers water damage restoration services including mold remediation. Our highly trained technicians can find, identify, and remove mold to get your home or business back to pre-mold conditions. 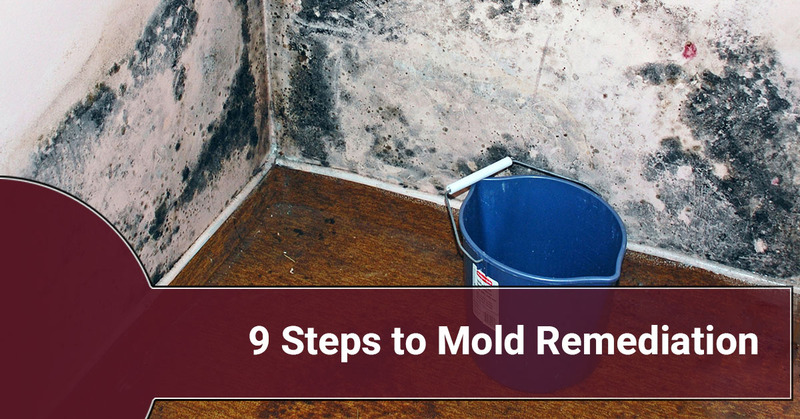 In the following post, we’re going to share the nine general steps to mold remediation. Many people want to start with mold discovery and removal, but the mold appeared due to a water problem or moisture build up. All Phase restoration takes the time to address the cause of the mold so it does not return after we’ve removed it. Once the water issue is resolved, we move to isolating the contaminated area. It’s important to close all doors, windows, vents, and more so the spores cannot travel while the mold is being removed. In more serious mold cases, we’ll cover doors and windows with plastic sheeting to contain the mold more effectively. We’ll take the time to moisten the contaminated area so dust particles are weighed down. This is so spores do not travel when we begin removing the mold. At this point, the mold is isolated and managed. We’ll begin removing water damaged material like furniture, sheetrock, isolation, and more, if necessary. The goal here is to not leave any mold behind. Before the material leaves the contaminated area, we’ll store it in plastic bags. During removal, we’ll store damaged material in plastic bags at least six-millimeters thick so mold does not escape upon removal and transportation. The bags will be wiped down prior to removal from the contaminated area to reduce exterior mold transfer. Finally, we’ll clean the contaminated area, wiping down all surfaces to remove any mold residue or dust. Using various tools, we’ll begin to remove visible mold, as well. Once all visible mold is removed, we’ll finish by wiping down surfaces again to ensure all mold removal. Once wiped, we’ll use a HEPA certified vacuum across the contaminated area. The ultimate goal is to leave behind zero dust or debris. We’ll visibly inspect the remediated area to ensure all mold spores, dust, or debris is completely removed. Leftover materials or objects free of the mold need to dry out to allow moisture to evaporate. This can be done in a variety of ways like fans, humidifiers, and an increase in air temperature. All materials or items which were moved prior to mold remediation should now be replaced. Any damaged items or material should be restored. Once all the mold is removed from your home or office, All Phase Restoration will follow up to ensure the effort was completely successful. We’ve been serving the Windsor area for years with water damage services, and we’re ready to help you. Give us a call today to remove mold or remedy any other water damage issues.